Nothing is out of reach in the realm of casual role-playing. Sorrow talks elusively and vaguely, hinting occasionally at some dark spot in his past. “I can never fully make up for what I did, but I strive to aid as many as possible, that they may never know the types of horrors I unleashed,” he says softly. Sorrow may not be forthcoming about the nature of his sins, but if you’re curious, you could always just ask David Thompson. For six months, they were the same being. Thompson, a 36-year-old husband and father who runs the IT department at WSU’s Small Business Development Center, has been a role-player for 26 years. Sorrow was one of his most memorable characters. He played the robed elf until it was paralyzed by a psi-stalker, and then killed in an explosion. But Thompson has also portrayed an aspiring off-Broadway actor, a god- like being who spent years planning a war, an archer, an orc, a princess. 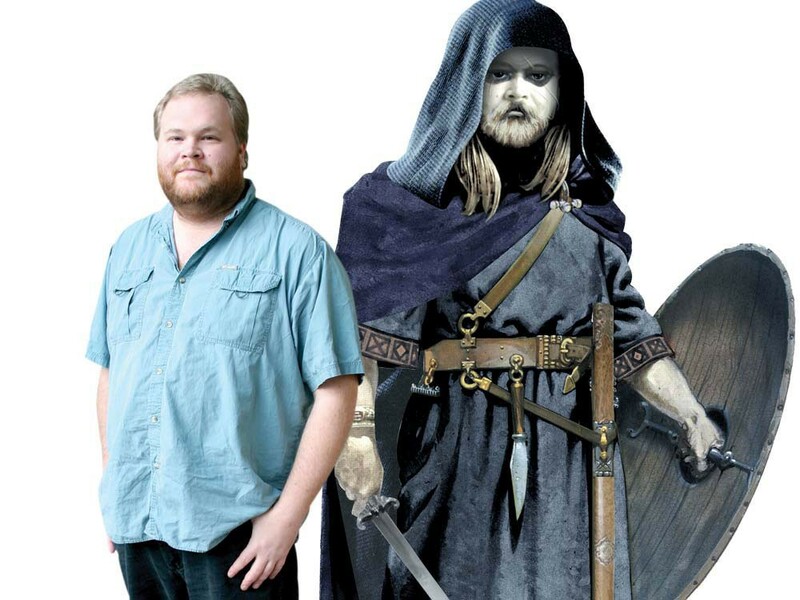 Though role-playing commonly evokes images of either tabletop gaming, like Dungeons & Dragons, or “LARPing” (in which players dress up as characters and act out their games), the activities of Thompson and others fall into another category: casual role-playing. This style can be hard to wrap your head around, because there are no boards, no prepackaged characters, no visual aids. Games begin with only the game book, some paperwork and, sometimes, dice. Everything else is up to the gamers. The group starts out by selecting a scenario — anything from fantasy to modern-day to zombie apocalypse. Games can last one day or several months, and some might never even result in a win. After the scenario is chosen, players design their characters — a process that can take hours, as they sift through game books and tease out even the most mundane traits: favorite books, alcohol tolerance, nervous ticks. Thompson says this allows the player to become more involved in the character. Half a dozen gamers sit on sofas and chairs, surrounding a table covered in pretzels and cake in Thompson’s Valley basement. They’re playing Amber, a free-form game with few rules and no dice that’s based on the series of science-fiction novels by Roger Zelazny. They have been playing this game every Sunday for four months and, for a newcomer, it’s nearly impossible to pick up the complex story. The players seem to be portraying a group of royals from the city of Amber, which is the center of the universe. These beings have the ability to travel and live in different dimensions, called “shadows.” The king has gone missing, and this group has been assembled to travel through the shadows to find him. One player cracks a soda while the others begin to navigate the storyline. The few who aren’t involved in the current scene are on their phones, texting or emailing their strategies to Thompson, the gamemaster. It’s his job to lead the characters through the game, intermittently consulting a 200-page book he wrote, which complements the official Amber game book. The players that are directly involved slip into character and begin. The other players smile, and there is an impenetrable flurry of character dialogue and laughter. “I’m still in favor of that,” says one character. “My manager will be quite happy to accommodate your needs,” Inari tags on, sneering. They laugh again, all in on a story and a joke known only to them. “Some moments of game history, much like movie quotes, live on forever amongst those that know them,” says Thompson. People still talk about Sorrow, for example. Thompson invested so much in the role — conveying in excruciating detail Sorrow’s strange behavior, his gaunt frame and maggot infestation — that it had a physical effect on other players. But he says the fundamentals of Sorrow’s character — how he rose from a dark place and into a good one, living a life to help others — stem from real-life experience. Thompson says gaming has extended into other parts of his life, benefiting him both as a husband and father. He plays games with Carmen, and together they spin creative stories their children can’t hear anywhere else. “The kids are learning to use their imaginations and creativity even more, and understand that they can keep those even as adults,” Thompson says. “We live in a world of make-believe and belief,” says Thompson, smiling. Those interested in casual role-play can check out the message boards at Merlyn’s Science Fiction-Fantasy Store in-store and on the web at merlyns.biz. Other sites to locate gamers are http://www.obsidianportal.com, http://www.sjgames.com and http://spokane.craigslist.org.